By June gardens and hedgerows are often peppered with young birds just out of the nest. They are usually ‘parked’ in a safe place by parents who return regularly to feed them. They are normally quiet to avoid attracting the attention of predators, but may make begging calls if any bird (or human) happens by. Although they may appear so, they haven’t been abandoned, so ignore the urge to rescue small birds to care for them yourself. Leave them alone and the parents will return to feed them. If you have cats in your garden, move the bird to a safe place (eg. perched in a bush off the ground) so it doesn’t become one of the annual millions of moggie victims. 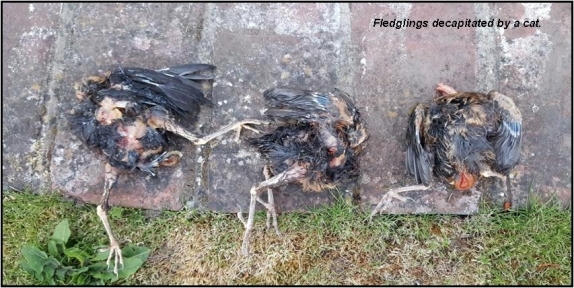 If you have a garden nestbox or a nest in your shrubbery, and a cat as well, it’s worth keeping the cat indoors in the early mornings as this is often when birds first leave the nest and are at their most vulnerable. It is often argued, quite rightly, that it is natural for cats to hunt. However, they are no longer living in a natural environment. Humankind has substantially modified and reduced the natural environment so that many birds are dependent on our gardens for food and nest sites. Cats in gardens – and they roam into other people’s gardens too and surrounding hedgerows – are behaving naturally in an unnatural situation. a sign they were taken by a cat. 'We detected evidence of disseminated (widespread) bacterial infection with Pasteurella multocida: this disease is known as pasteurellosis. The robin was in thin body condition and appeared to not have eaten recently. The ultimate cause of death is likely to be starvation/exhaustion triggered by the ill health caused by the infection with the bacteria. It’s always entertaining for us watching the parents desperately trying to cram food into the ever-open bills of their young, but the parents can’t stop, even if they wanted to. They are programmed to respond to the bright yellow gape of their youngsters by giving it food - even if it is a chick of a different species. In the nest, the chick with the biggest gape is likely to get the most food, so will have the most energy. 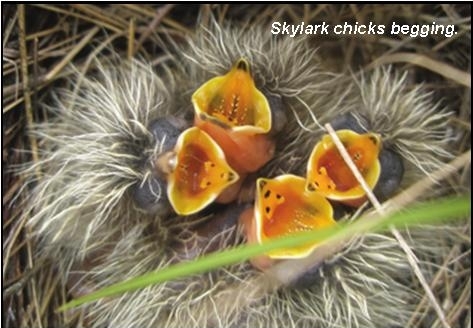 In cold, wet springs when food for chicks is scarce, as it was in 2016, the ones with the most energy will beg the most, getting the major share. So those with less energy (or smaller gapes because they were hatched later) are likely to die. which also act as a trigger for the parents’ attention. Meanwhile, busy parent birds will often take advantage of the garden feeding station, so it’s worth taking a few steps to help them in their seemingly non-stop task. First of all, avoid providing poor-quality food like bread as it fills chicks up without providing sufficient energy. Make sure food is not mouldy, and keep your feeders and bird baths clean as young birds are especially vulnerable to disease. If you can find them, mealworms are ideal. 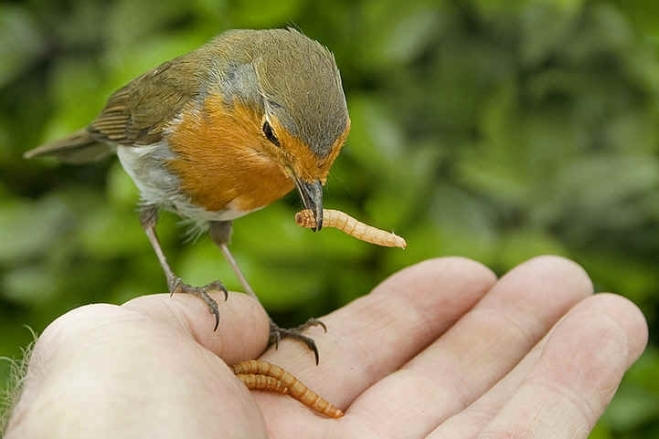 If you don’t like the idea of live ones, dried mealworms are cheap and easily available, but soak them first before putting them out; nestlings rely on moisture in food for their water and a dry mealworm could even lodge in their throat and choke them. Our garden robins will sell their souls for mealworms! An excellent alternative at any time of the year is 500g of Lidl’s or Tesco’s cheapest porridge oats, mixed with half a bar of lard; zap them in the microwave for a few minutes to melt the lard and stir it in.